Rabat - FIFA is proud of Moroccan football fans! The international football association has predicted that Moroccan fans will occupy numerous seats in the 2018 World Cup stadiums. Rabat – FIFA is proud of Moroccan football fans! The international football association has predicted that Moroccan fans will occupy numerous seats in the 2018 World Cup stadiums. 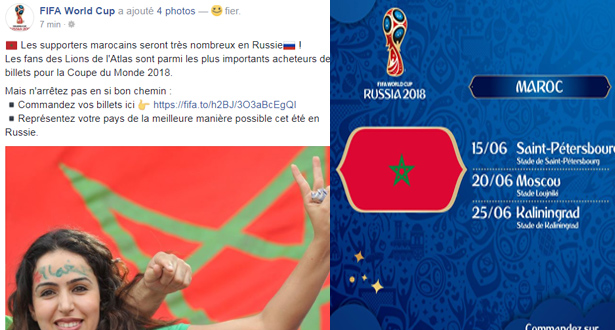 Supporters marocains, vous serez parmi les plus nombreux lors de la #CM2018 ! ???? The association has also encouraged the fans to buy more tickets in order to attend the competition. The Atlas Lions fans had an eminent role in their team’s qualification to the world tournament. During the World Cup qualifier games, the supporters showed great respect, confidence and support for their team in order to boost their enthusiasm and determination to qualify for the World Cup. The fans were highly lauded for their support by the Moroccan team, its coach and the FRMF, the official Royal Moroccan Football Federation. “I am delighted for all the Moroccan fans who have encouraged their national team throughout their appearances,” said Morocco’s team coach Herve Renard. 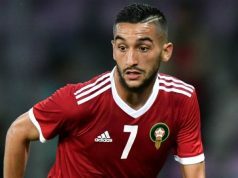 After a qualifier game against Gabon played on October 7 in Casablanca, Moroccan-Dutch star Hakim Ziyech told the press that “Casablanca’s fans are astonishing.” Morocco defeated Gabon with a 3-0 victory. 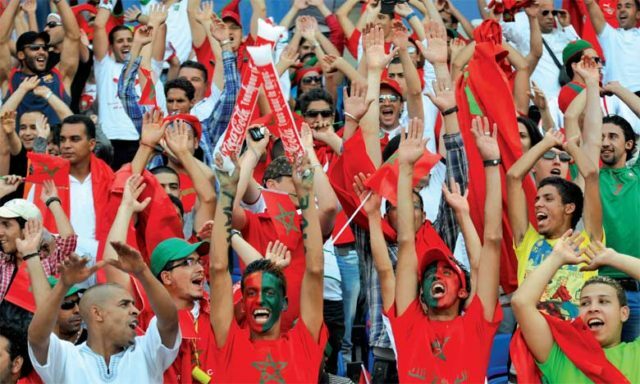 Hundreds of Moroccan fans have also followed their team to Cote d’Ivoire on November 11 to cheer on them in their decisive game against the Ivorian Elephants. With the support of Moroccan fans, the Atlas Lions delivered a great performance against the Ivorian team and scored 2 astonishing goals.